Construction is on schedule in Ephraim. Photo by Tad Dukehart. 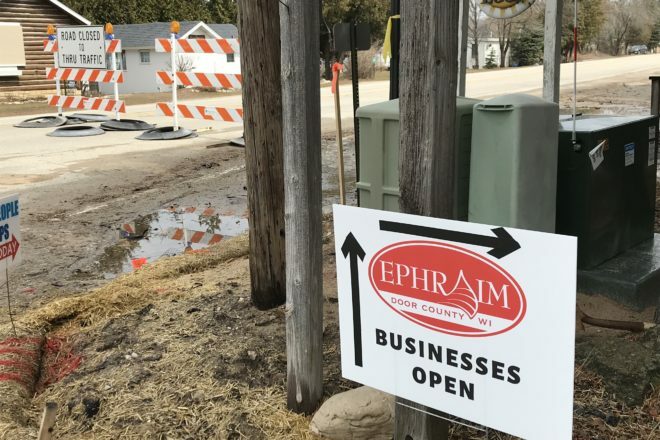 Ephraim administrator Brent Bristol reports that highway construction is on schedule and all storm sewer work will be completed the week of April 15. Storm sewer work this week will be occurring between Hidden Spring Road and German Road. Once complete crews will begin removing the balance of the existing asphalt in the reconstruction area in preparation for grading. Streetlights from Brookside Lane to Anderson Lane will also be removed. Upon completion Northern Electric will start running electrical conduit beginning at Anderson Lane and working south. The sanitary manhole project is complete, and if Frontier Communications completes their work as scheduled the utility poles from the Wetland Preserve to German Road should be coming down the week of the April 29.